Attention to detail EVERYWHERE-Bug resistant adjustable micro mesh pre-filters.EZ View windows offer easy grow snapshots without compromising your environment. All metal interlocking poles provide a stable and strong growing enclosure that's perfect for indoor gardening success. -MATERIAL-: Interior Material-Diamond Textured Mylar, significant increase in reflectivity for improved lighting performance. Exterior Material- 600D Thread Count Canvas , Double Stitched Around All Corners. Double Cinching Ducting Ports. Removable Floor Tray Included. Offers A Lightproof, Waterproof, Tailored Environment. -IMPROVED ZIPPERS-: Heavy-Duty ,Double Stiching Design To Provent Odors And Light From Leaking Out.Seals Well And Long-lasting Use. -STURDY FRAME-: Diameter 0.6"&Thickness 0.03" Coated. 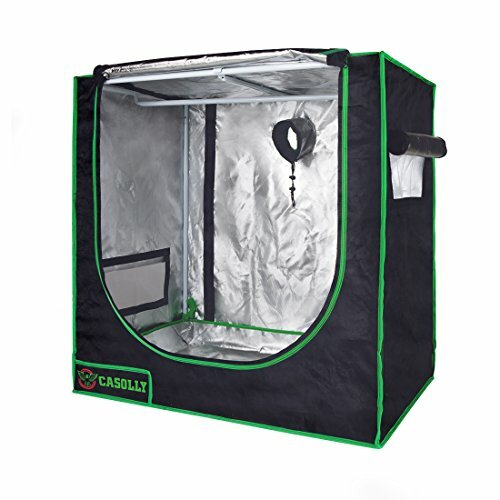 The Solid Metal Frame Has Reinforced Connections At The Corners and Will Support Well Over 110 lbs Equipment Like Grow Lights, Carbon Filters, Fans and More! -PRIVACY PACKAGE-: Packaging Absolute Privacy with Blank Outside Packing.The Poles Were Marked With Letters/Numbers In Instructions,Tents are Easily Assembled Even If You've Never Done This Before. No Tools Required. Includes Detailed Step-By-Step Instructions In The Box . -WARRANTY-: High Promise Depends on High Quality.If You Don't Like Our Tent, We'll Instantly Provide Replacement or Refund.1 Year Warranty. If you have any questions about this product by Casolly, contact us by completing and submitting the form below. If you are looking for a specif part number, please include it with your message.